O'Briensbridge and its looped walk. The “permanent” closure of a small section of a National Looped Walk near O’Briensbridge in the interest of safety has been described as “using a sledgehammer to crack a nut”. 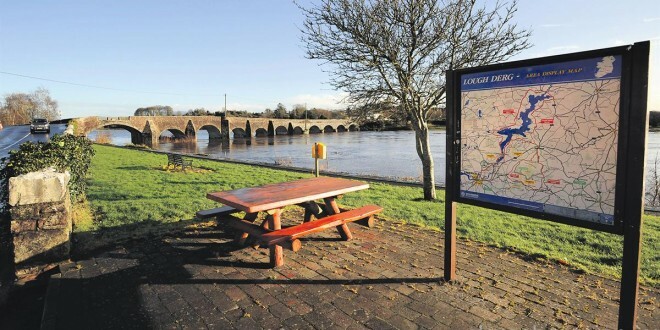 Councillor Michael Begley made the assertion after it emerged that it could take years before the public walkway near the bridge in the village is re-opened after it was closed off last week. Last week, Clare County Council explained this walkway was shut for the “forseeable future” after Christy Crotty and a young toddler passed under the bridge minutes before mortar fell when the bridge was hit by a truck. This was the second incident involving falling mortar after another walker, Sean O’Dowd, has a similar experience. However, it could take years before this walkway can be used again, after the council linked its re-opening with the opening of the Killaloe bypass. Killaloe Municipal District senior executive engineer, Hugh McGrath explained the council couldn’t give a date for re-opening as it is dependent on heavy goods vehicles being removed from the bridge, on foot of the implementation of a weight restriction. “Such a weight restriction is not likely to be considered until the Killaloe bypass is opened. Repair of the bridge will be carried out at the earliest opportunity, in accordance with heritage legislation,” he said. Tom Tiernan, transportation senior engineer, has informed O’Briensbridge Community Group public relations officer, Mick Murtagh, that the reason for the closure of the short section of walkway under the bridge is public safety related, which has to be the authority’s priority. “Fortunately, practically the entirety of the walkway system remains available to the general public. Were it not for the ongoing vulnerability to traffic impact of the wall from which stones can fall from time to time, we would be making arrangements to open the closed section of walkway in the near future,” he said. While there is general agreement the council was left with little option but to close the walkway, the duration of the closure has caused dismay and disappointment among local community activists and councillors. A High Court judicial review is currently being undertaken concerning the proposed development of a new River Shannon crossing at Killaloe and bypass of the town. In the event that the second bridge is approved by the High Court and the necessary funding is secured, it could take at least two years before it is fully complete. If there are any unforeseen setbacks, it would take between three and five years before the second bridge is built. Councillor Begley pointed out that linking the re-opening of the walkway to the construction of the Killaloe bypass is an extreme measure. Instead, he believes the engineering assessment should facilitate a compromise proposal that would take into account heritage and safety considerations. Stressing that road safety for pedestrians and motorists supersedes heritage considerations, he said a minor adjustment of the bridge could make a big difference. He said the placing of a protective canopy over a portion of the walkway, which has been put forward by Mr Murtagh, is one of the proposals that should be seriously considered by the council. Councillor Tony O’Brien said he would do everything in his power to reach a solution that doesn’t involve a long-term closure of the walkway. Municipal District chairman, Councillor Joe Cooney described the latest development as “very disappointing news”. Councillor Cooney called on the council to carry out its proposed engineering assessment on the corner of the bridge, to facilitate repair work as quickly as possible. He said closing part of the walkway sends out the wrong message for local and visiting walkers and hoped this would be a short-term instead of a long-term measure. Mr Murtagh said he was “shattered” and “terribly disappointed” to learn about what he described as the “permanent” closure of the walkway. Just when the popular Green Loop was getting the recognition it deserved, he expressed fears the closure notice would put at risk up to 12 years of hard work preparing the looped walks, as it could result in visiting walkers going elsewhere or not enquiring about how they could go on an alternative route. He stressed that all other options, including a protective canopy for the walkway and re-examining measures to provide more space for heavy goods vehicles completing the turn at the bridge, should be considered by the council instead of this closure.